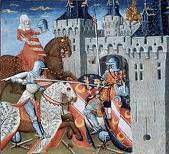 Arthurian romance is normally characterized by a highly precise travel trajectory in which knights leave the Round Table in search of “aventure” and subsequently return. At the same time, the search for “aventure” involves what seems like much random meandering. In this essay, I theorize a logic to this knightly wandering. I argue that travel in Sir Thomas Malory’s Arthurian oeuvre is inextricably linked to sexual behavior. The code of sexual ethics engendered by travel narratives applies equally to males and females. Male and female sexual transgressors are condemned to equally constraining travel narratives, while virgins of both sexes enjoy a kind of free mobility. Chivalry dictates the need for a very particular kind of travel. In constructing a fixed link between sexual ethics and travel, Malory’s narratives code sexual behavior as an ethical determiner of chivalry.